At it’s true essence, showing respect can simply be done by doing to others as you would like done unto you. Simple and easy. Clearly stated. Treat people how you want to be treated. Give people the same value, time, adoration, admiration, gratitude, compliments and intensity that you would want to be given. If you get nothing else out of this article, this simple tip can be the tip that helps you show respect the most. But there other awesome ways that we can use to show respect to people in our lives. Well below I get into what they are. So that we can learn to master the art of respect. And literally make anyone in our lives feel that they are respected by us more than anyone else does in their lives. A feeling of deep admiration for someone or something elicited by their abilities, qualities or achievements. So when it comes down to it, both of these phrases sum of the definition of respect. It shows that is in part having regard for WHO people are. And showing adoration and admiration for what made them who they are. In essence, respect is admiration. And people love to feel admired! Below are ways that you and I can use to to elicit this feeling of one feeling admired and respected. Ways that we can use to who people that we respect who they are and even see the potential of who they can become in this life. When it comes down to it, showing respect can even be a selfish pursuit. As it is showing the world your true colors. Our outer world and how we react to it is an reflection of our consciousness. The more we respect ourselves, the more we can respect others. So respecting people and going it more and more often can mean that we are becoming better people by doing so. And becoming better people makes us feel better about ourselves. Which in turn, makes us respect ourselves more. And then treat people with even more respect. This is the power of respect and showing it to others. The power of respect has a way of letting someone know that we see the best in them. We see great potential and recognize them as a person of value. That they are a big contributor to making the world a better place. That they have a purpose in your life and being on this earth. It is a way to show someone that you care about them. And that they affect you in a meaningful way. Eye contact is an excellent way to show respect. It is showing that you are truly listening to them and that you are giving them the respect that it takes to not be distracted by anything else. A great article by NewsDay.com talks about how eye contact can really show you are bestowing respect to the other person. It shows that we are being sincere along with paying attention during the conversation. But it starts with talking about how we should not do so in a way that is a “hard stare” as this can make someone feel uncomfortable. We can do this by focusing on areas of the face for 4 seconds at a time. So start with the entire face for 4 seconds. Then the eyes for 4 seconds. As well as glance around the face for one to two seconds at a time. hitting the major areas of the face including the chin, nose, forehead, etc. And repeat this process until the entire conversation has come to a completion. Another great article by digest.org talks about the significance of eye contact and creating trust with the person. That it is not only eye contact that is important, but also what we do with our eyes. We all pay attention subconsciously to things when we make eye contact. For example if someones eyes dilate, it shows arousal and attraction. And when pupils constrict, it makes us feel that someone is not trustworthy. Of course we can’t control this part of eye contact fully. But we can control things like the amount that our eyes dart around or too much blinking. Which portrays that you are feeling uncomfortable or defensive. Try to have eyes the are widely open. Not too much squinting or glancing away. This shows that you are attracted to the person and what they are saying. And that are are truly respecting what they have to say and their entire presence and input in the conversation. And shoot for a minimum of four to five seconds which has shown to always lead to grater liking between the two parties. Which you can show respect by simply making the other person feel liked. People are also more likely to believe statements made by someone who is looking them in the eye. So this is a way we can utilize the power of influence in order to make someone feel more respect. We can bestow on the respectful statements. And they will take them with more sincerity than someone who is avoiding eye contact. A sincere utterance of “thank you” to someone shows a great deal of respect. When it comes down to it, people want to feel that they are valuable. Their time. Their knowledge. Phrases like this show that you respect the person and what they have to offer and bring to the table. It makes people feel that they are valuable. An inherent need in all of us. We all have a feeling that we are being evaluated by the people that we come into contact to. For the reason that we are. We all give someone a mental score of how our interactions go. We often times wish we hadn’t wasted time even talking to people. Or we are glad we did because a conversation made our day. People know this and feel this. And we can validate their need for value by saying thank you more often. At very least it is validating someone. And validation is a great way to show respect. As it is providing compassion to someone. It is making someone feel appreciated and that you are grateful for their existence. It makes you look polite, and opens up someone to communicate more often and for longer periods of time with you. People will, from then on, feel more respected in your presence as they have new and positive memories to reflect on about you. Like I said above, people evaluate you. They read you consciously and subconsciously. If we feel as if someone feels good about themselves and has high self esteem, we treat them with more respect then someone who shows that they have low self esteem. May sound harsh, but is is entirely true. So we the amount of respect we can give to someone is in direct correlation with how much we love and respect ourselves. Not violating our moral codes. The more we violate or morals, the more we hate ourselves and regret our choices. When we think better we act better, which ultimately makes us feel better. When we feel better we treat ourselves better. Refrain from letting others thoughts shape you. Many people will try to cut you down because they are projecting their own insecurities on you. What someone says about you doesn’t have to be come your reality. Any thought we have about ourselves, as Darren Hardy talks about, was merely an opinion before we ever accepted it as true. Always believe empowering things about yourself. Speak highly about yourself. No self depreciating thoughts. Always monitor your mind and replace negative thoughts with their positive counterparts. Always be learning and developing your passions. By following these 5 simple but powerful tips, you can start to have immense respect for yourself. Which will, in turn, allow you to bestow the same amount of respect on the people you come across in your life. When it comes down to it, you can really extend the length of a conversation and add value to it by asking questions to the person you are talking about. It shows that you care enough about them to dig deeper than normal. Even if you are visiting your local coffee shop, you can show respect by simply asking “How’s your day treating you?”. The more questions you ask, the more people will open up to you. You can then answer in respectful ways to the questions they ask you. You can start to get personal and ask more about what they do for a living. And then compliment them on doing the things necessary in order to attain such a professional position. When we are conversing with people, often times we are simply waiting for them to stop talking so that we can get our chance to stop talking. To get our chance to shine. But when it comes down to it, people LOVE to be heard. Truly heard. Think about a time in your life where someone was truly listening to you. They may not have even given you any advice on how to solve the problem you were talking about or what you were venting about. But they simply said things like – “I totally get how you feel that way.” Or “Can you tell me more about that?”. Conversations like this feel great and are imprinted into our minds because the person is truly listening to us. They are giving us the respect of simply allowing us to have the floor. Personal development author and speaker Stephen Covey, talks about how we should always listen with the intent of UNDERSTANDING. When we seek to understand the person we are talking to, we create much more intimate and personal connection. This shows that you respect the other person and place more emphasis on understanding them instead of interjecting with your own personal agenda. So as much as you can, seek to first understand people and try not to think about forming the best response to inject as soon as they are done talking. Listen, pause to reflect on what they are saying. Reiterate what you heard back to them in your own way to show them that you have been listening. And reply in a way that shows them that you are listening to what they are actually saying. Not just he conclusion you drew yourself. Try not to assume that you know what they are talking about. Converse in a way to where you are always re-learning what people are saying. In a way to which you are receptive to them changing pace during conversation. Refrain from drawing any conclusions until you validate what you think they are concluding. When showing respect, it is great to try to be an asset to people. Give more than you take. Always be seeking to add value to other peoples lives. Try to make connections between people to where you can introduce them to people that can help them better their personal or professional lives. Also return favors to an even greater extent to those who have been kind enough to help you along the way. Show them that you are grateful for their help and that you want to help them even more. This can show much adoration and respect for someone who has helped you get ahead. When someone asks you for help with someone, try to help in a timely manner. Show up fully and on time when you make commitments and be there fully. People value their own time. And when you are either late, or aren’t efficient with their time by getting distracted or wasting time with meaningless conversation, people feel that you are taking advantage of them. You can show respect by allowing people the courtesy of showing them that your respect their time. And that their time is valuable. Snide remarks are cut downs belong nowhere in life, especially when you are trying to show someone respect. No matter how the conversation is going, always seek the positive. Always bring good energy into interactions and seek to say things to the other person that show them that you see them even better than they may see themselves. Say positive things about them with genuine sincerity. This can go a long way. You have the ability to reach your goals. You have such a positive, optimistic, realistic, idealistic outlook on life. You have such contagious positive energy. You have made such an impact on my life. I appreciate you, your friendship, your mentorship, etc. You bring out the best in people. You are excellent at your job. You have such a positive outlook on life. I accept you just the way you are. You have awesome taste in clothing. You are an awesome leader, dad, mom, brother, sister, etc. I am so thankful we met. You are a good human. A big part about showing respect is knowing your audience. If they are more formal and more reserved, it may be good not to come in super hot and energetic. Respect that person’s lifestyle and the way they operate. Refrain from telling dirty jokes or cussing if the person isn’t like this. It can be totally OK and even build relationships better if you do so with some people. But with others, it can end the connection abruptly. And from then on out, they can judge you from that experience and not open up to you during the next interaction. I am not saying that you shouldn’t be yourself. But with respect and communication, it is best shown in a way to where you adapt to how people are. This is how you can influence people more as they see you as being like them. They feel safe in your presence. And this allows one to become more vulnerable. And when people are vulnerable, the open up more and feel respected as they are talking to someone who they can and feel as if they can truly connect with. Truly caring about someone can mean bringing up the things most people don’t want to talk about. Because of the fact that you want to show that you care about someone, you can be the one to have those tough conversations. The truth about it though is that no one likes to be wrong or seen as weak. But when you communicate to someone that you truly care about their success and then lead to tell them how they can become better, this can be seen as unconditional caring. This is a high form of showing respect for someone. This is true when it comes to showing respect. We can’t be efficient with people. We must be patient enough to let them communicate and then given them the courtesy of taking enough time and energy to respond in a way that lets them know that we aren’t trying to push our interaction along at a pace faster than it should be going. We may not want to be patient as we want to be efficient. But patience equates to efficiency. Because people will open up more to you and won’t feel as if they are being treated like a number. Or another obstacle in your way to getting to the end of the day. They will feel valued. And in turn, because of this will feel respected. When it comes down to it, being believed in feels great. It shows us that people see that we have potential. We can show people respect in believing in them. Their goals, dreams and visions. Encouraging them to go after what they want in this life. For the sole fact that we believe that they have WHAT IT TAKES. We have all had at least one person that seemed to believe in us. To see in us what others or even ourselves may have not seen. To see potential and let us know that we have it. We will never forget this person. Because they had such an impact on us. For me, it was a baseball coach. But I am sure you have had people along the way encourage you to be the best. We feel admired, and like I discussed above, showing respect is showing admiration. The two go hand in hand. You can be that person for people. A truly encouraging person. Some how uplifts people and encourages them that they have what it takes to get what they want in life. You may be the only person in this persons life doing this for them. And in turn, this person can feel more respected by you than any other person in their whole life. Saying nice things in front of people has a great affect on how people feel respected. You are showing people that you believe in them enough to put your own reputation on the line. That you believe in them enough to show it in front of a group. That you have their back. People will feel respected and will feel as if they owe something to you in a sense. Of course not that you would take advantage of them in this regard. But that you have made such an impact on them that they will remember you. They will remember that you do respect them a lot. At the end of the day, the more respect and adoration we give, the more we respect and adore ourselves. And while not everyone deserves our respect, we can still give it regardless. We can see people that don’t deserve it as a test. If we can give respect to even the toughest person, it will be that much easier to do to people who do deserve it. It is also a reflection of yourself. If you respect everyone, you will respect yourself and be seen by others as a respectful person. Never stoop to someone else’s level. Kill them with respect and then respect your own self by removing yourself from situations. People are going to have conflicting opinions, ideals, beliefs and viewpoints. The point of the matter being that we don’t need to oppose them just because we are opposite. Respect is shown when you see a person for the individual that they are. Just because they don’t think like us doesn’t mean they are wrong, were raised wrong or are bad people. It just means they are coming from different perspectives and were raised differently. Take up a sense of curiousity when people oppose you. Say things like “I came up believing things this way. How and why do believe that?”. This shows the person that you aren’t going to attack the from being different from you. Try your best not to be offended. Stay curious. Be accepting. No one likes to be judged. The best way to show respect is to be completely accepting of all the person is. Also, no matter if the person is younger than you. Smaller than you. Has less education than you. Or speaks less eloquently. Treat them with the same respect you would if you were talking to the CEO of a company. Just because people have things about them that can make them seem inferior, doesn’t make them so. It is awesome to remember someone’s name the first time you meet them. And then from then on, sprinkle it throughout your relationship. It shows respect as you are taking mental space to remember this person. Often times we have the bad habit of meeting someone, then right away forgetting their name. Do your best to remember peoples name as soon as you meet them. This will build better relationships with the people you talk to. And make them feel a sense of importance. Plus it feels good to be called by our names. It is the sweetest word we can and want to hear! Don’t treat introductions like a formality. Commit right away to remembering the persons name. Be fully engaged instead of seeing it as a passive formality. Repeat their name to yourself 3 times in a row, silently while looking at their face. Repeat their name multiple times throughout the conversation, depending on how long it lasts. Try to play with the name by rhyming it, linking it to a location or one of their hobbies. Ask them how they spell their name. This will give you another chance to learn their name and store it to memory. Anytime someone tells you something they are proud about, try to remember it. Then bring it up. For example if you know someone is lifting weights, tell them how much of a beast they are in the gym. Or if they have hit any personal bests with the weights since you have seen each other last. You are recognizing someone positively for something they work hard on doing in their life. People put a lot of hours into the things they love. Recognizing this makes someone feel very special and respected. The best way to be real with people is to be completely honest. Telling the truth is the utmost respect you can show to an individual. No one wants to be lied to. Even if they are white lies. They are still breaking the trust with someone. We can sense that we are being lied to. Even if we don’t consciously register it, we can feel it at a deeper level. Tell people the truth. Honesty truly is the best policy when it comes to showing people respect. It is how we want to be treated. No one wants to be lied to, right? Would you rather hear the cold hard facts? Or have the truth be danced around because people are afraid of disappointed or hurting you? The truth right? We need to give people the same courtesy. Be very sincere. If you can’t be sincere, speak less. People are too good at spotting phony interactions. There is nothing worse than someone who is slurring or talking lazily. This happens at places like Walmart a lot where we need help from people. We ask where the electronics section is and we get something like “In the back.” It is short and isn’t very helpful. We want to talk eloquently and address the person with our words in a way that shows we have energy behind them. That we aren’t trying to get through our conversation with them. That we value them enough to use full and complete sentences. And be punctual in out approach with our speech patterns. This is a great way to show someone respect. We justify our actions, or lack thereof with excuses. We were late meeting someone so we blame it on the traffic. Instead we should say that we should have left earlier. Take ownership with people instead of giving them excuses. No one likes to be fed excuses. We are all adults. We need to take massive ownership of our lives. And give the same respect to the people in our lives. Also, share in people’s excitement. Mirror their excitement. Act as if their win is your actual win. Show them that you are excited for them. This will make people feel as if you want the best for them and truly care about them winning. We don’t want to give the sense that they are our competition. Or if they are winning, that means we are losing. We want to celebrate their success and show them that they have the ability to keep succeeding. And most of all deserve the success they attain. So there you are my good friends. 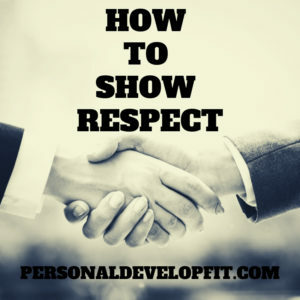 How to show respect to people in conversation. I hope you enjoyed the article .Share with me what your favorite tip was. As well as if you have any good tips to add that can help us respect people more! Have a great day my friends.